Speed is crucial when you need to replace forklift parts causing equipment downtime. That’s why we stock more than 100,000 lift truck parts and accessories at all times - so you can get what you need, when you need it. In fact, we maintain an unprecedented fill rate of 99%, which means that 99% of orders are filled within 1 business day! 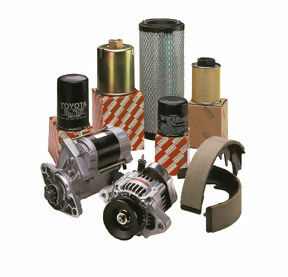 Our Toyota Genuine and STARLIFT parts fit every make and model of material handling equipment. So, no matter what kind of equipment you have or what kind of parts or accessories you need, you can count on the well-trained, experienced, and award-winning parts experts at Williams Toyota Lift to get your lift trucks up and running in no time at all. Williams Toyota Lift is very proud have a fleet of fully-stocked service vehicles which average an amazing four-hour response time to service calls. You can rest assured that when you call us for service, our technicians will save you time and money by having the right parts for your vehicle - regardless of the make and model.